Gina “Conviction” Iniong has been a professional martial artist for the greater part of the last seven years as the six-time Philippines national Wushu champion’s extensive experience has brought her from the boxing ring to the Muay Thai circuit and eventually to the ONE Championship cage, where she has chosen to pursue her dreams of becoming a world champion. Soft-spoken and generally reserved, Iniong admitted that it has been difficult adjusting to the spotlight. While the biggest stars relish their time in front of the cameras, Iniong prefers to do her talking on the battlefield. “Although I have been in this game long, I am still very shy. I do not think I will ever get used to talking to a large group of people. Speaking my mind and sharing my thoughts is a lot scarier than being inside that cage, that is for sure. It is better to let my fists do the talking,” she said. Ever since she directed her career path to ONE Championship, Iniong has let her actions speak louder than her words as she looked absolutely dominant on the global stage. The 28-year-old Team Lakay product battered Natalie Gonzales Hill en route to a unanimous decision this past April. 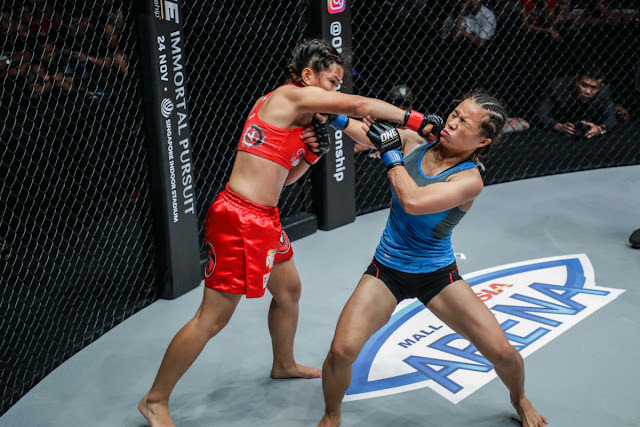 In front of a hometown crowd last 10 November at ONE: LEGENDS OF THE WORLD, Iniong extended her winning streak inside the ONE Championship cage to two matches with an outstanding second-round finish of Indonesia’s Priscilla Hertati Lumbangaol. Exactly fourteen days after her remarkable conquest of Lumbangaol, Iniong will make an immediate return to action to face Mei “V.V” Yamaguchi in a three-round atomweight encounter at ONE: IMMORTAL PURSUIT, which takes place at the state-of-the-art Singapore Indoor Stadium in Singapore on Friday, 24 November. Iniong accepted the offer to fill in for ONE Atomweight World Lee Angela Lee, who withdrew from her title defense against Yamaguchi after suffering injuries from an unfortunate car accident nearly two weeks ago. 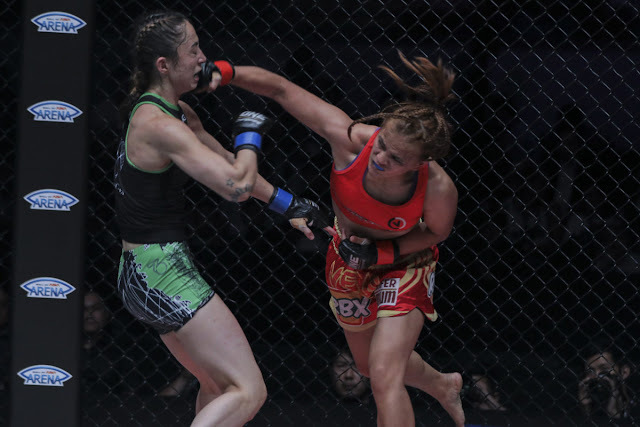 The aforementioned atomweight collision on the main card of ONE: IMMORTAL PURSUIT is a rematch from their first encounter three and a half years ago under a regional show in the Philippines, where Iniong pulled away with a razor-thin split decision victory over Yamaguchi. Iniong believes that her second meeting with Yamaguchi could be seen as a stepping stone to a future shot at the world title. “That is my ultimate motivation, to become world champion. That is why I joined this organization, to showcase my skills and to prove to the world that I have what it takes to be the best. My opponent is a good striker, so I have no doubt that this will be an entertaining contest,” she stated. Iniong would have no qualms about going into an instantaneous title shot against Lee should she be victorious over Yamaguchi on Friday. “I will face whoever ONE Championship wants me to face. I am ready, anytime. But I have my eye on the champion, and I want that belt,” she declared. As Iniong is set to step inside the ONE Championship cage for the third time this 2017, she has a clear vision in her mind. Iniong knows that she will be locked inside the steel structure opposite a familiar foe like Yamaguchi, but she also recognizes what she has to do to get the job done. “I will try to finish my fight in with a first-round knockout or submission. This is an opportunity to put me closer to my dream. I am giving everything that I have to get my hand raised this Friday,” she ended. ​For more updates on ONE Championship, please visit www.onefc.com, follow us on Twitter and Instagram @ONEChampionship, and like us on Facebook at https://www.facebook.com/ONECh ampionship.